Known as the home of the Dallas Cowboys football team, AT&T Stadium is a venue like no other. Located in Arlington, Texas, it has 80,000 seats and is one of the most unique stadiums in the country. The maximum standing capacity is 105,000 guests, making it the fifth largest stadium in the NFL. AT&T Stadium can accommodate groups of up to 8,000, making it the ideal Dallas event venue for a wide variety of events. Whether you’re planning a corporate reception, company meeting, conference, convention, trade show, gala, or team building event, AT&T Stadium can handle it all. It also has a retractable roof, ensuring a flawless event experience regardless of the weather outside. 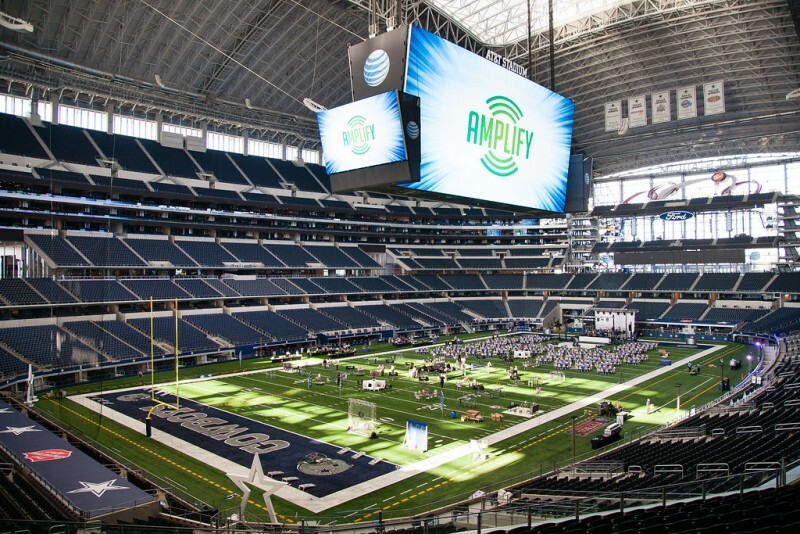 The On The Scene team has experience producing stand out corporate events at AT&T Stadium. Whether you’re planning a large-scale company-wide event, or an intimate dinner reception, we will work with you every step of the way. Our knowledge of the venue allows us to make recommendations on which of the event spaces is right for your specific event. We’ll become your behind the scenes partner, learning your corporate culture, company goals, and brand, to produce a one-of-a-kind event that attendees will be talking about for years to come. 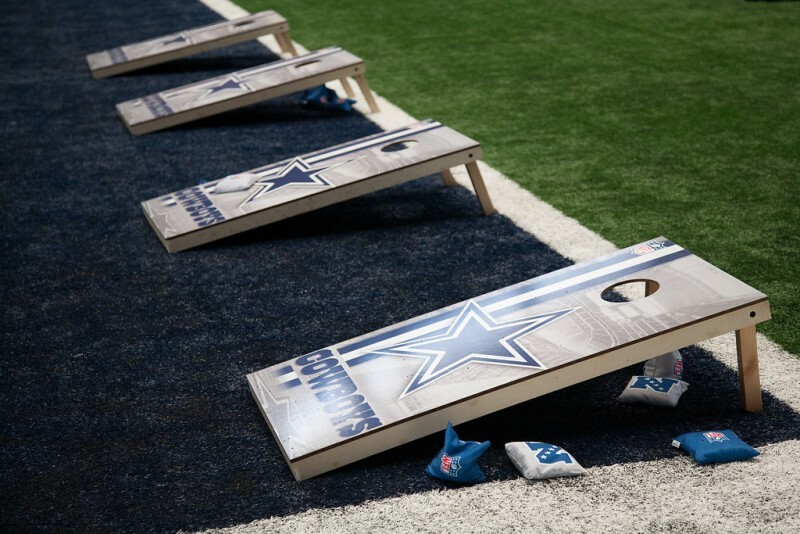 AT&T Stadium has 22 unique event spaces that can accommodate any type of special event. Cowboys Locker Room (150 guests) – The players locker room, this space is ideal for smaller receptions or seated dinners. End Zone Platforms (2,500 guests) – There are six different end zone platforms that can be used individually or together for a large-scale event. The platforms offer gorgeous views of the entire stadium and the Dallas skyline. Field Level Clubs (350 guests) – The stadium offers two separate clubs,The Miller Lite Club and the Draft Kings Fantasy Sports Lounge, that are perfect for cocktail hours. IT Amphitheater (48 seated guests) – The amphitheater is perfect for presentations or breakout sessions, and is equipped with state-of-the-art AV equipment. Main Level Club (2,500 guests) – With more than 30,00 square feet of event space, the clubs are perfect for formal receptions and large elegant dinners. Media Press Box (200 guests) – This private space offers a unique view of the stadium. Post-Game Interview Room (150 guests) – This space offers classroom style seating that is ideal for meetings of up to 100. Silver Level Lounges (500 guests) – With more than 8,700 square feet of open event space, these lounges offer gorgeous views, LCD tvs, and AV equipment. Upper Concourse Bars (150 guests) – A modern and distinct space, these bars are great for private dinners or cocktail parties. An award-winning Dallas event management company, On The Scene has years of experience producing innovative and unique corporate events for a variety of industries. If you’re interested in hosting your upcoming Dallas event at AT&T Stadium and need assistance with coordination, logistics, implementation, and production, contact On The Scene today!